Acclaimed films from Gabriel Axel and Ang Lee will be available on Criterion Blu-ray this July. 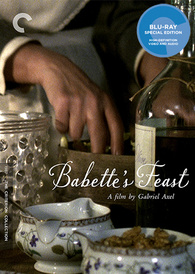 In an early announcement to retailers, Criterion has revealed 'Babette's Feast' for Blu-ray on July 23. At once a rousing paean to artistic creation, a delicate evocation of divine grace, and the ultimate film about food, the Oscar-winning 'Babette’s Feast' is a deeply beloved cinematic treasure. The Blu-ray will feature a 2K transfer, a DTS-HD Master Audio 2.0 soundtrack, and supplements will include: New interview with actor Stéphane Audran; Karen Blixen: Storyteller, a 1995 documentary about the author of the film's source story, who wrote under the pen name Isak Dinesen; New visual essay by filmmaker Michael Almereyda; New interview with sociologist Priscilla Parkhurst Ferguson about the significance of cuisine in French culture; Trailer; and a booklet featuring an essay by film scholar Mark Le Fanu and Dinesen's 1950 story. Criterion will also be bringing 'The Ice Storm' to Blu-ray on the same date. With clarity, subtlety, and a dose of wicked humor, Academy Award–winning director Ang Lee renders Rick Moody’s acclaimed novel of upper-middle-class American malaise as a trenchant, tragic cinematic portrait of lost souls. The Blu-ray will feature 1080p video supervised and approved by director Ang Lee and director of photography Frederick Elmes, a DTS-HD Master Audio 5.1 soundtrack, and supplements will include: Audio commentary featuring Lee and producer-screenwriter James Schamus; Documentary featuring interviews with actors Joan Allen, Kevin Kline, Tobey Maguire, Christina Ricci, Sigourney Weaver, and Elijah Wood; Interview with novelist Rick Moody; Deleted scenes; Footage from a 2007 event honoring Lee and Schamus at New York’s Museum of the Moving Image; Visual essays featuring interviews with the film’s cinematographer and production and costume designers; Theatrical trailer; and an essay by critic Bill Krohn. You can find the latest specs for 'Babette's Feast' and 'The Ice Storm' linked from our Blu-ray Release Schedule, where they're indexed under July 23.